Iello’s fun and chaotic card game Pingo Pingo will get you up and moving, literally. Some aspects of the game require you to physically get up, run to an object in the room and get back to the table before the crazy penguins invade. The fast-paced game revolves around a 15-minute soundtrack (the game comes with a CD, but you can download the soundtrack to your smartphone). As the music plays, different actions take place. For example, if the song is playing daytime music, players must adhere to daytime rules on the cards. The same applies to night. If you are away from your seat when the crazy penguins shout “Pingo Pingo” and you might lose your loot. The fun comes with the action cards. If you draw a yellow-border action card, you will have to perform some physical feat. For example, you may have to run to the other side of the room to tap the suspension bridge base. Or, you may have to shoot a wild beast with your dart gun. Yes, the game comes with a dart gun. The point of the game is to gather treasure from the island by drawing cards and following their actions as quickly as possible. You have seven health points. When you lose all of your points, you lose the game. If you make it to the end and have the most treasure, you win. 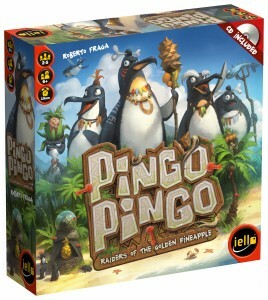 Pingo Pingo is available now from your local board game shop for a retail price of $34.99.